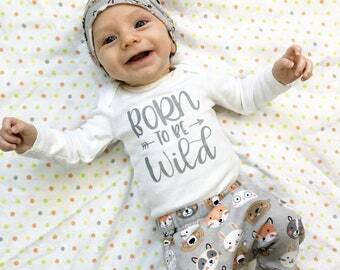 This adorable baby coming home set includes the perfect outfits for a set of boy girl twins! 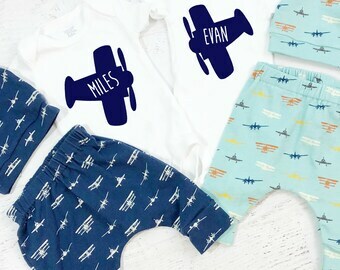 - Leave babies name's with the correct spelling in the "note to seller" section of check out if you purchase the onesies! Please note, because this is a custom bodysuit, once it is made the decal is permanent and the name on it can not be changed. So please double check the spelling of little one's name! - Headband is made with super stretchy and soft nylon that is gentle on skin and grows with baby to fit from size newborn to 3 years! - Handmade with love from Maine! Cute little pants. I ordered them to dress a doll and they fit well! Very tiny, very cute little pants. I actually ordered them for a doll. If a buyer changes their mind before I have shipped an item, please notify me and I am happy to refund your money for the full amount (the exception to this would be for personalized or custom orders which can not be refunded unless due to defect by the shop). I thoroughly review and inspect each order before shipping to be sure it is accurate and free of defects. If for some reason your are unhappy with your purchase upon receipt, please let me know immediately and I will do my best to resolve any issue you have with the product! Prior to leaving a negative review on my shop, please please contact me via Etsy convo! I strive to offer the best customer service for my buyers, so please allow me to provide that for you and resolve any problems you may have before posting a review! If you receive an item that appears to be defective and is the apparent fault of the shop, I am happy to issue a refund, and ask that the recipient please return the item to me so I can be sure any issue does not happen again for another customer. Once I receive your defective item, your refund will be processed within 24 hours. If you'd like to exchange the defective item, the replacement must be purchased from the shop first, and I must also receive the defective item before I can issue a full refund of your money. The customer is responsible for any shipping cost back to us, but will receive free shipping on the exchanged item purchased! All returns must be processed within 30 days of receiving your order or the item cannot be returned. I do not accept returns or exchanges due to sizing complaints. PLEASE read size charts closely prior to making your purchase to ensure you receive the size you desire! For your convenience, each listing has an applicable size chart for the item listed. Thank you for your understanding! Please keep in mind every item in my shop is handmade and may vary slightly from product photos, but that is the charm of purchasing handmade! Every item is uniquely crafted and one of a kind! For printed design fabrics, pattern placement may vary. Also, please be aware there may be slight color variations between your computer's color calibration and the actual item. Items are made to order. Most items will ship within 1-2 weeks. Please be sure to give the correct shipping info and address during the check-out process, I cannot be held responsible for an item that is shipped to the wrong address! Once an item is shipped, I cannot alter the package's destination. Also, please understand I cannot guarantee a delivery date or be held responsible for shipping times due to the nature of the postal service. All items are shipped from Maine and will arrive depending on your shipping choice at check out! \If you see something you like, but wish it came in another color, please message me! I love to make custom orders, and I am happy to try and match your color wishes with what I have to offer! Please never leave children unattended with merchandise. I am not responsible for any potential injury related to any of my products. By purchasing from my shop, you agree to the terms and policies. I stand by my special creations 100% and I'm certain you'll love your purchase! Please feel free to message me with questions. I strive to provide an excellent shopping experience for my buyers and I love to hear your positive and constructive feedback! Thanks for choosing Mainely Baby! I like an item in the shop, but wish it came in another color. Do you make custom orders? Yes! I love making custom orders and many of my products can be customized. I have a wide array of colorful vinyl, so the majority of our onesies can be altered to your preferences! Sorry, I am currently taking a break from wholesale! 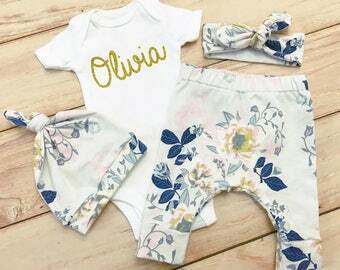 Bodysuits: wash inside out with like colors, gentle cycle, cold water, and tumble dry low or hang dry to preserve color and design on the fabric. Pants: wash inside out on gentle cycle in cold water. Tumble dry on low setting. Newborn: Up to 21 inches (height), 5-8 pounds (weight). 3 months: 21.5 - 24 inches (height), 8 - 12.5 pounds (weight). 6 months: 24 - 26.5 inches (height), 12.5 - 16.5 pounds (weight). 9 months: 26.5 - 28.5 inches (height), 16.5 - 20.5 pounds (weight). 12 months: 28.5 - 30.5 inches (height), 20.5 - 24.5 pounds (weight). What are the designs on the bodysuits made of? 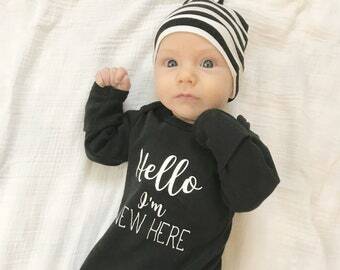 Each bodysuit is designed and created with high quality tee shirt vinyl that is permanent and washable. Please see care instructions for details.